Ten teams took to the floor for the semi-final with the XS Latin C team, dancing Rio, drawing third. They gave an energetic and spirited performance of the Rio routine, far surpassing training performances. The semi-final was closed by XS Latin B team, dancing The Planets with a calm and strong maturity which showed a step change from the performances of the B team at previous nationals. When compere, Marcus Hilton, announced the six teams recalled, XS Latin were utterly delighted to discover that all three XS teams had been recalled to this prestigious final. In joint seventh place were Shappelle’s All-Ladies team, dancing Michael Jackson, Kent Latin Team dancing Aladdin and Latin Steps Adult Team dancing Old Hollywood. Fever Dance Company B team placed tenth with their Celine Dion themed programme. Fever Dance Company opened the final dancing a clean and sharp performance to their dramatic Final Fantasy music. Wearing yellow, the team looked well rehearsed and strong. XS Latin C team danced second. In the club’s classic blue sequinned dresses, the team were so delighted to make the final that they surpassed their semi-final performance, dancing with complete commitment and energy. Shappelle’s A team danced third to their latin mash-up music. The team showed good quality dancing, especially from their men, and the music had impact. 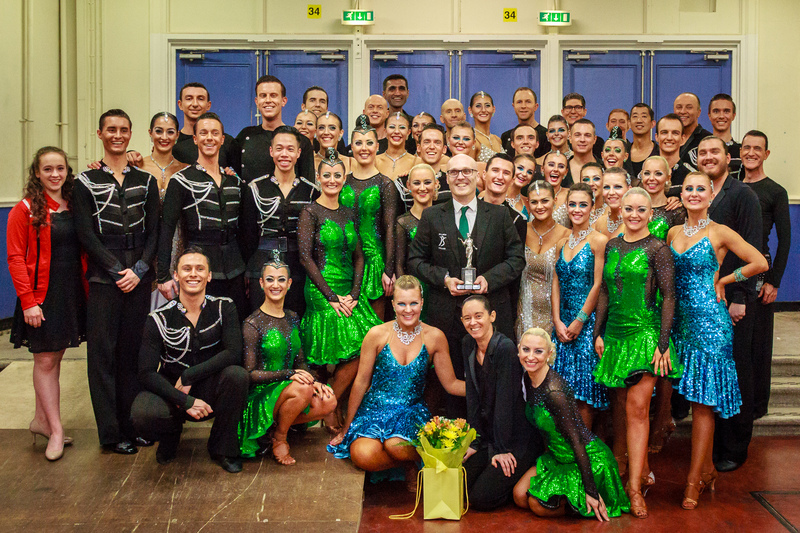 XS Latin A team took to the floor fourth with their British Open winning Wicked routine. The team danced with the calm confidence that their successful year to date warranted and led to a number of the other coaches declaring that they felt they were clear winners. The performance was strong and clean and delivered with conviction. Loren James Dance Academy were very happy to make the final of this competition with their Adele routine. Once again, the team, beautifully turned out in tan and crystal dresses, danced a performance which was stronger than their clean semi-final performance. XS Latin B team closed the final with The Planets. The team have started to show that they can string good performances together and their final was another very good quality performance of the team’s most difficult formation routine to date. The results were announced very soon after the final had been completed. And with a clear majority of first placings, XS Latin A team were delighted to recapture the British National Formation Championship title. It is the seventh time that the team has won this title, which is a record number of wins in this competition for any team. The club’s pleasure at this result was consolidated by fourth place for the B team and an unprecedented 5th place finish for the C team. XS Latin would like to thank the organisers of the competition, who put on a successful event in very challenging circumstances with the venue which was undergoing emergency repair work on the ceiling. One benefit of this was that the judges, for the first time in recent history, sat on the first balcony with a good view of all the teams’ patterns, and all of the dancers were able to perform to the audience. In addition, the team would like to thank all of our many supporters, who traveled to Blackpool and cheered very loudly and enthusiastically for all three teams, and all our competitors for the their support and superb performances. Finally, we would like to say a huge thank you to Rachel Gibbons and Ballroom Bling for their continued sponsorship of our A team.